Those who meal plan consistently share a few secret benefits that the rest of the world is missing out on: they make fewer trips to the grocery store, they spend less money on food, they waste less food, and they have the peace of mind of knowing what is for dinner. However, one of the greatest benefits of meal planning is that it is an essential tool if you are seeking a healthier you. Whether your health goal is to lose weight, manage allergies, or have more energy, you are going to need to be more intentional about the kinds of food that you are putting into your body. And being intentional about what you eat means having a plan — a meal plan, actually. However, with all of the food trends available to us, deciding which foods will help you achieve your health and wellbeing goals can be a complicated journey because each of us has a unique body with unique capabilities and needs. Thankfully, there are gifted people that can give us a little direction. First off, tell us about your work. The Conscious Cleanse is an online 14-day cleanse. This program is unlike traditional liquids-only cleanses or juice-based cleanses in that participants will eat whole foods–and lots of it! On the program participants eat meat, fish, beans, nuts, seeds, non-gluten grains and, of course lots of veggies and fruits. We’ll eliminate common allergens and teach people how to find the foods that work best in their body. During the program our participants receive individualized coaching through a private online forum. Our highly trained coaches are involved in the cleanse every step of the way, and are on call 8 hours a days answering questions in the forum. They also do personalized support via email at no additional cost. The forum is also a place to meet and receive support from other participants in the program. Additionally, we do live Q&A’s to connect with participants and offer our support and coaching to them. Our mission is to make sure that every person feels cared for and supported. We work with a lot of people to not only help detoxify their body, but to create a sustainable way of eating that will support them on their journey to vibrant health and longevity. What are the common health issues that you see with participants coming to your program? We see people from all walks of life. Many people initially want to lose weight and jump start a healthy eating routine, but others have larger health concerns like high cholesterol, food allergies, body aches and pains, or a chronic disease that they’re struggling with. Our program attracts a wide spectrum of food preferences as well. We get people who are just starting out their healthy eating journey to people who have more experience with healthy habits. Our program has a lot of flexibility for all types of eaters–vegan, vegetarians, meat and potato lovers and even paleo lifestyle. How does meal planning fit into the cleanse? Do you have any tips for people who are just getting started? Meal planning is crucial to healthy eating. What we notice is that when people don’t have healthy food prepared, they’re more likely to grab for that salty, sugary, carby gut bomb because they’re so hungry and can’t go another second without eating. Meal planning takes the guesswork out of food choices, while getting the rest of the family’s meal in order. As far as tips go, having a tool to plan your meals in crucial. We love Plan to Eat for that reason because it’s so simple and easy to use, We love the drag and drop recipe tool! Another tip for meal planning is to build a salad bar in your fridge. 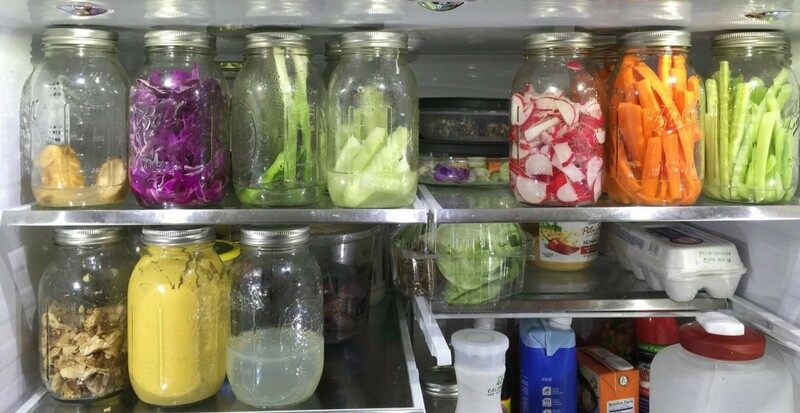 Designate a few large jars or storage containers to hold your “fixins.” Each time you visit the grocery store, buy 2-3 veggies that you can immediately chop up for easy access. Every time the jar empties, fill it with a new chopped, sliced, or shredded vegetable. The constant rotation of these veggies will ensure you’re sprinkling a raw rainbow salad over your greens. This is also a great way to experiment with new produce. Some veggies, like shredded carrots, beets, or sliced fennel and cucumbers, last longer if stored in water. Many of our users have hundreds of recipes in their account, and there are millions of recipes on the Internet, how do we narrow down our options? How do you choose recipes? What’s your process? We love this question! It can get really overwhelming in the sea of online recipes. What helps narrow down our search is to look for really simple recipes. We love to eat, we love to cook, but we don’t love spending all of our time in the kitchen. Usually if we see more than 10 ingredients in a recipe, we’re on the hunt for another.☺ We’ve found that the easier the recipe, the more likely we are to make that recipe again and again. Having a handful of go-to, simple and easy recipes makes sustaining clean eating possible in the long run because you’re building new habits. The goal with the cleanse is to create lasting changes for life after the cleanse. How does meal planning fit into that life? Preparation is key to any healthy-living plan. We use the Plan to Eat menu planning site not just for cleansing, but also for non-cleansing times. We notice that we’ll be more efficient and effective with our time in the kitchen, if we’re more prepared. And like we said, we love eating good, healthy, real food, but we don’t love slaving away in the kitchen all day! If you are ready to make a lifestyle change but are not sure where to start, Conscious Cleanse’s next cleanse will begin on April 6th (here are the details – Please note that this is not an affiliate link. We hope you find this resource useful). This is a great opportunity to receive additional guidance to help you find the healthier you. We have only 1 winner, but for those of you that would like to do the April 6 cleanse and are not our winner, the Conscious Cleanse is offering a $25 off code to anyone who enters the giveaway. Simply enter the giveaway and the $25 coupon will be e-mailed to you when the giveaway closes. Thank you Jo and Jules for taking the time to share your expertise with us! For more information about the Conscious Cleanse, and some great resources, visit the Conscious Cleanse website.